Over 50 people arrived at the Bike Repair Hub in New Columbia on a beautiful Saturday afternoon. Some people stopped by purely because they were curious about the large fleet of bikes glistening in the center of the Bike Skills Park. “I woke up this morning and my brother told me there’s a bike ride today. 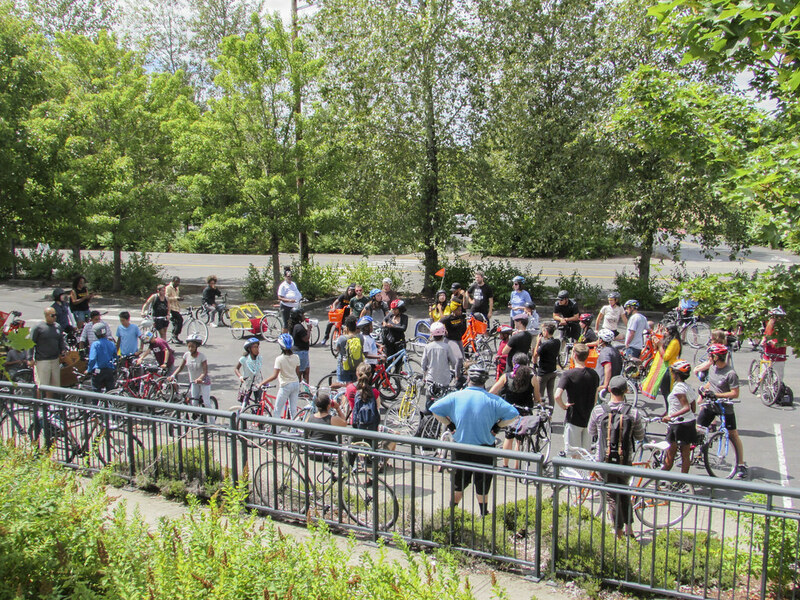 I always go to the Sunday Parkways ride and I really like it. So I’m here,” mentioned one young resident of New Columbia. Laquida Landford and Donovan Smith had much more in store for the day than a bike ride. 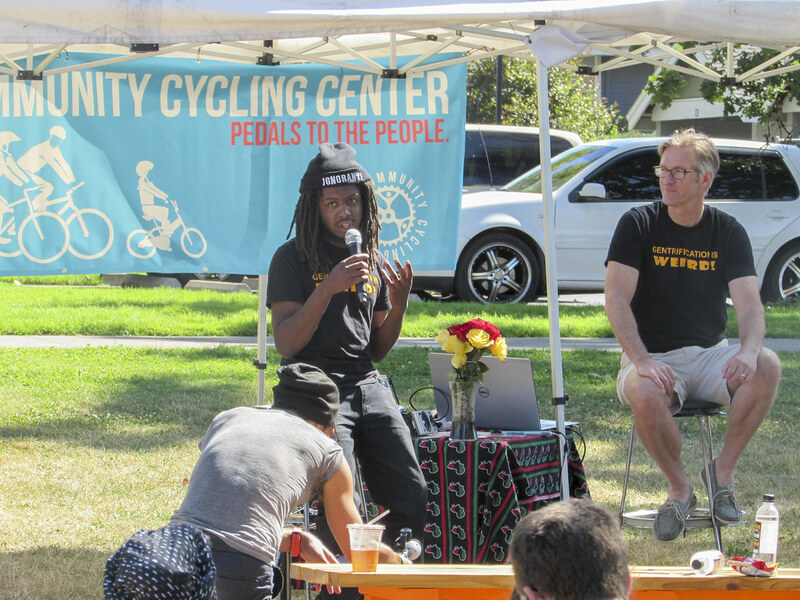 These two community leaders came together with the Community Cycling Center to create a ride that addresses the deep wounds communities of color have suffered due to gentrification. 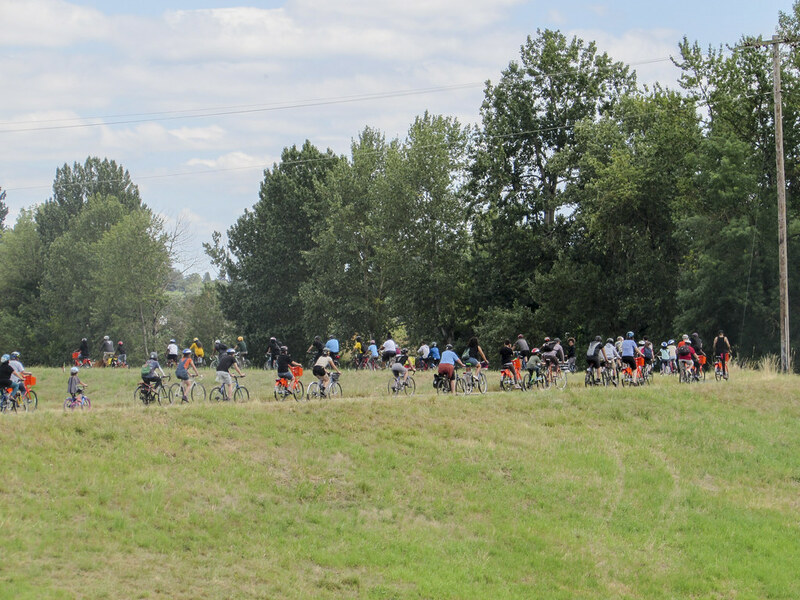 The ride, as it turned out, would navigate along with the Columbia Slough Trail and end up at Portland International Raceway, or what was once home to a thriving city called Vanport. He’s right. In the 1940s, Vanport was once home to a vibrant community of people who worked in the shipyards. At its peak, Vanport was the 2nd largest city in Oregon at over 40,000 people. It had schools, stores, a movie theater, just like any other city. In 1948, residents received a letter stating that the dikes surrounding the city were safe. City officials intentionally misled the residents that everything would be okay. On Memorial Day, one of the dikes broke, flooding and wiping out the city in less than an hour. That day, 18,500 residents were displaced, and approximately 6,300 were black. 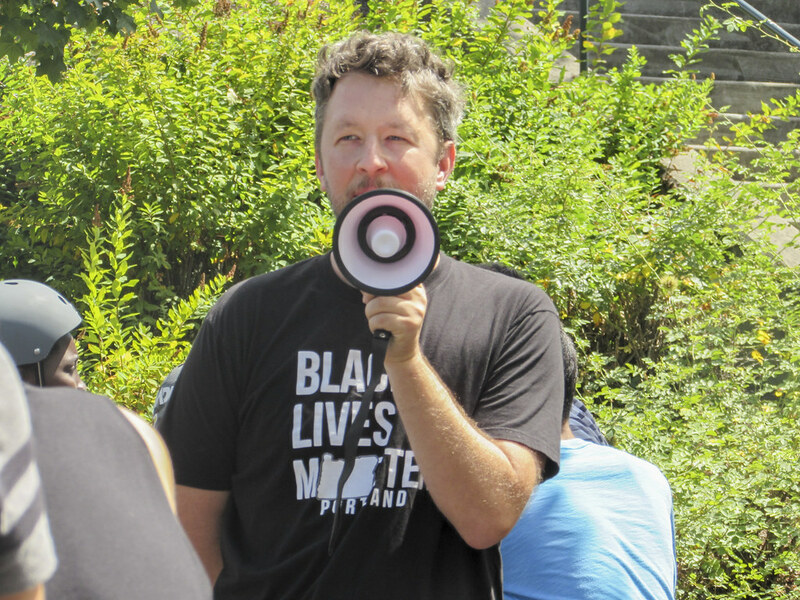 The black community was significantly affected by this tragedy because the City prevented them from living in many of Portland’s neighborhoods. The story of Vanport is largely untold, but there are many people keeping this history alive today. 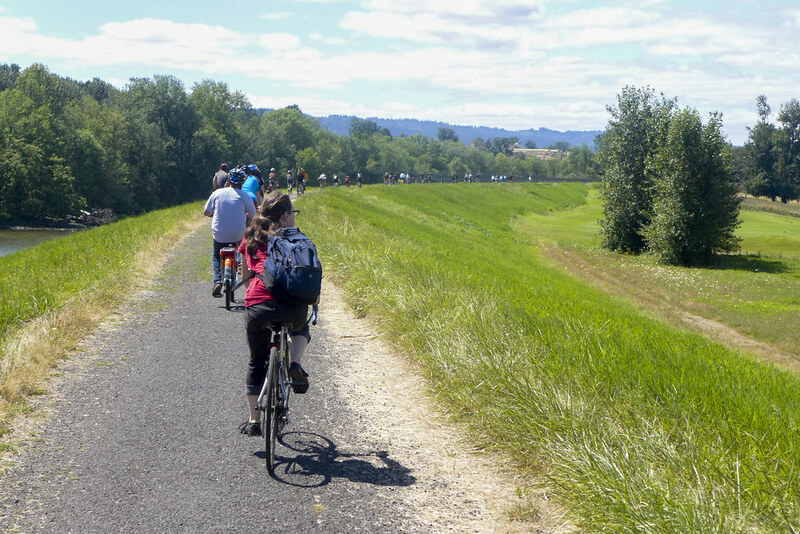 We heard from one woman on the ride who works at the Vanport Mosaic Project, an organization that is keeping the history of Vanport alive through storytelling and oral history. And one survivor of Vanport brought her aunt’s scrapbook of articles and photos about the history of this great tragedy. 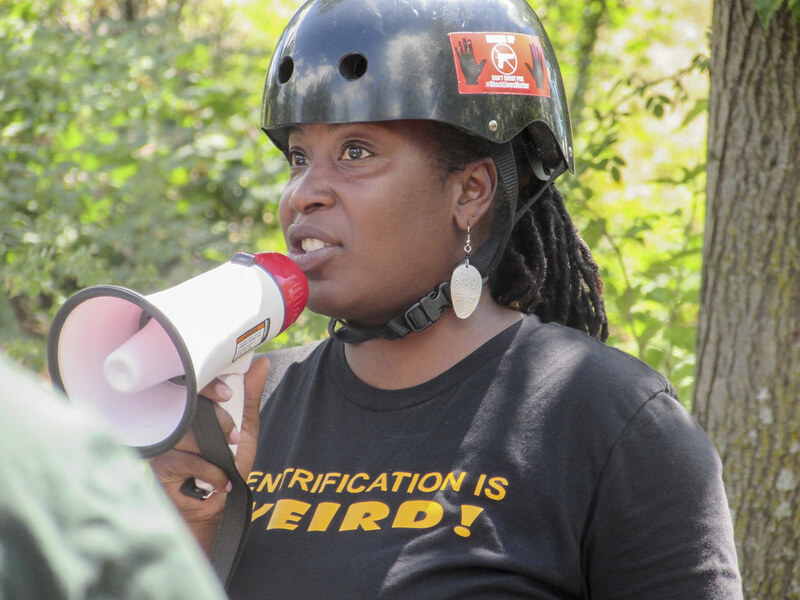 Laquida’s goal for the ride was to “provide resources and build a bridge for new black people in Portland to learn about the history.” She wanted to connect the history of Vanport to the current crisis of people of color being displaced through through gentrification. Borrowing its namesake from a popular design produced by Donovan’s clothing line Ignorant/Reflections, “Gentrification is WEIRD!” The Ride, also included a live performance from John Slaughter, a brilliant documentary by Llondyn Elliott, music from DJ Ryder, and a thought-provoking conversation about gentrification between Donovan and Mayor-Elect Ted Wheeler. Wheeler encouraged people to continue to invite him to events like this in the future. He pledged that he doesn’t want to work entirely inside his office in City Hall, but outside in the city with the people. We will share a video of Donovan’s interview with Ted Wheeler in the coming weeks, plus more photos from the event. Stay tuned. Thank you to everyone who participated in the event. Let’s continue the conversation and healing! 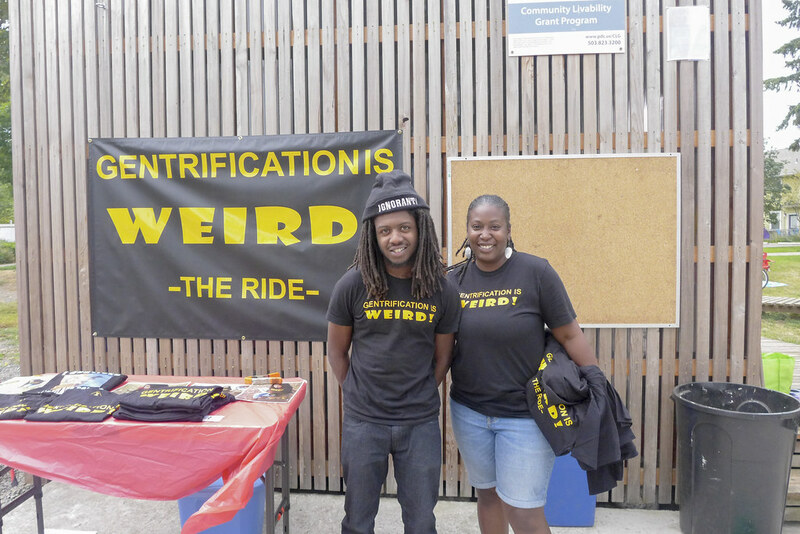 Thank you, Metro, for your generous sponsorship of Gentrification is WEIRD: The Ride. 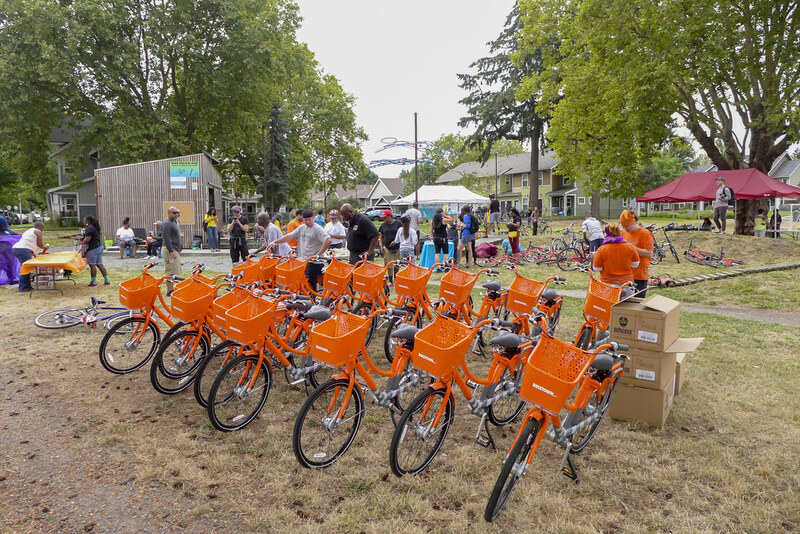 Thank you BIKETOWN for providing a fleet of bikes to use on our ride.